Prime Minister Tony Blair has said it is time to mark the end of the "1960s liberal consensus" on law and order. Trailing Labour's five-year plans on fighting crime, Mr Blair argued people now want a society with respect and responsibility. 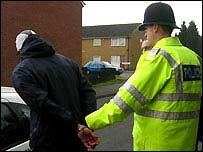 Under Monday's plans, the 5,000 most prolific criminals in England and Wales are to be constantly satellite-tracked. But opposition parties say the package only tries to grab headlines without offering genuinely new measures. With tackling nuisance behaviour a major target of the plans, the public are to get the power to call on police and councils to tackle such problems. And they will be able to trigger inspections of local police forces by gathering petitions. Fixed penalty notices are also being extended to cover under-age drinking, lower level damage and theft and misuse of fireworks. In a one-day exercise last year to establish the extent of anti-social behaviour, the government recorded 66,000 incidents (see table below). Home Secretary David Blunkett also announced a new neighbourhood policing fund, helping to recruit 20,000 extra community support officers. Tagging and satellite tracking will double so 18,000 are tracked at any one time. Mr Blunkett said the move could target the 5,000 most prolific repeat offenders, who committed one in 10 crimes. He said they could also act as "prison without bars" for lower level offenders. He also promised electronic border controls to work alongside his plans for a national ID card scheme. Earlier, the prime minister set the scene for the five-year plans by warning that 1960s liberalism had gone too far. Mr Blair said: "People do not want a return to old prejudices and ugly discrimination. "But they want rules, order and proper behaviour." Mr Blair said the 1960s saw great breakthroughs on individual rights, women's rights and rejection of discrimination, deference and rigid class divisions. Law and order policy had become focused on offenders rights and preventing miscarriages of justice. "Meanwhile, some took the freedom without the responsibility," he said. And the era spawned a group of young people without parental discipline or a sense of responsibility. Mr Blair continued: "Here and now, people have had enough of this part of the 1960s consensus." He said there would be trial without jury if there was any intimidation of those doing jury service in criminal trials. Mr Blair said that as tough as government action seemed, it was not tough enough for the public and the new plan would be a "step change". "For the first time in my political lifetime the politicians, public and police are actually on the same side," he added. But Liberal Democrat home affairs spokesman Mark Oaten said: "People do not want an end to a free and liberal society, but sensible solutions to growing problems. "This government promised to be tough on crime and the causes of crime. We have seen a lot of get tough rhetoric but little progress on tackling the causes." 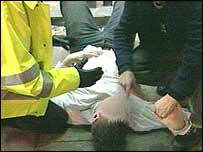 The Conservatives say crime and disorder have increased under Labour despite numerous "crackdowns" and gimmicks. Tory shadow minister James Paice said the government was offering centralised control, more bureaucracy and spin. "Reassurance won't come from words or money alone but from results," Mr Paice told MPs. The Home Office aims to cut offending by 15% by 2008, a target that was agreed with the Treasury as part of last week's spending review. The five-year plan will see a scheme combining police, councils' and other agencies' efforts against anti-social behaviour grow from the current 12 pilot schemes to a further 40 areas. The fifty worst offenders in each of the 50 areas will be named and targeted, said the Home Office. Mr Blunkett said pilots of the scheme would begin in the autumn and be focused on young people. The government plans also include directing more drug users will be directed to community treatment, with tough penalties if they fail, the Home Office will say. By 2008, it expects 1,000 drug-using criminals to be referred to community treatment each week. Overall the Home Office needs to reduce the 5.9 million offences recorded in England and Wales in 2002-2003 by 885,000. "The problem the government has got is that we have heard all this before"